Several years ago, Fiona was the only survivor of the Red Scarf serial killer, who shot and killed Fiona's cop fiancé and his K-9 partner. 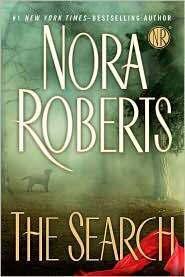 I read The Search by Nora Roberts when it first released back in July and it has taken me a long time to write the review, it kind of fell through the cracks. So instead of writing a summary of the book and events, I'm just going to write down my thoughts. Simon is rude, direct and honest. I think those three words best describe Simon, except to that you add a dry sense of humor with a grouchy, grumpy exterior and you have the whole deal. I love the fact that Simon wins Fiona without having to use charm. He attempts to be domineering, but is willing to compromise when necessary and knows his faults. Fiona is a strong, self-sufficient and loving female character. With her, it's all about the personality not the looks. Her insight comes from her deep understanding of animals or dogs in particular, a gift. When we meet Fiona she has already experienced personal growth through grief, loss and trauma, however new circumstances bring Fiona a new understanding, healing and finally freedom from those earlier experiences. She isn't intimidated by Simon's rudeness or grumpy exterior and wins him over with her self-confidence, direct manner, sense of humor and gift for understanding. I always enjoy this type of female protagonist in a contemporary romance, so this was a treat for me. The dialogue is excellent, especially the give and take and interactions between Simon and Fiona. Simon tells Fiona she is not "his type" but keeps coming back for more, and Fee doesn't really care if she's not his type, she just laughs at him. Their scenes together are some of the best in the book and there are enough of them to justify the "romance" in the "romance suspense" label. These two make a great couple. And what can I say? I love, love, love the developing relationship between Simon and his puppy Jaws from beginning to end... those are some of the best and funniest scenes. The dogs turn out to be the best secondary characters of the story -- don't they always steal the show? I particularly like the way Roberts uses the dog training to focus and develop the romance. The suspense is well integrated into the story and I think that the development as well as the outcome makes sense. The whole suspense part of it is mostly about Fee healing and freeing herself from the past trauma and finding the strength to deal with the present. The situation with the search for the villain and figuring it all out definitely kept me interested. The climax to the suspense part is not action packed, but more or less expected. In this case, it worked quite well. The research for this book is excellent, a Nora Roberts trademark. Fee's dog training and canine search and rescue scenes are quite detailed and extensive in parts. Although I enjoyed the scenes with Jaws and Fee's dogs, there's no question that my one quibble is the amount of dog training scenes included which, in my opinion, make the book a longer read than necessary. There is excellent balance between the romance and suspense in The Search. I really enjoyed Roberts' last book, Black Hills, but enjoyed this one more and I think that's due mainly to that balance as well as to Fee and Simon's personalities. I loved the dogs as secondary characters and the way Roberts used dog training scenes to focus on and develop the romance, but think that those same details were too extensive at times making this an unnecessarily long read. The suspense made sense to me and I liked that the story didn't end with big drama but well enough taken into consideration the villain's nature and needs. Great review. I haven't read any NR in years - she's not usually my thing, but your review really makes me want to read this. Hey, I've read this one. :) Didn't you rec it back in July or whenever? I'd never read a Nora Roberts, but you (or somebody) recced this one, and it has doggies so I gave it a try. Good stuff! I liked that Fee had all her ducks in a row and wasn't looking for some guy to straighten her out, and I agree that watching Simon learn to appreciate and get along with Jaws was pretty awesome, heh. I haven't run out to stock up on more Nora Roberts books, but I enjoyed this one and will probably try another one some time. Thanks Lori, this is a good SR by NR to read, if you haven't read one in a long time. Fee had all her ducks in a row and wasn't looking for some guy to straighten her out, and I agree that watching Simon learn to appreciate and get along with Jaws was pretty awesome, heh. You said it so well... especially the part about Fee. I loved that about her. This was a fun read! Loved the info about the dog training. You nailed the book on this review. I'm surprise to say that I liked how rude Simon could be. Lol. I like how Simon was with Fiona; the two of them together are different but yet they go well together. I'm not a fan of dogs but Fiona's dogs actually have me oohing and aahing over them. I can't wait for NR next single title. I so enjoyed her stand alone books as much as the series. I've really only read The Chesapeake Bay saga. Those I loved. Nora Roberts other books...don't entice me as much (if that makes sense). This does sound good though. Tabitha, yeah. I loved Simon too... he and Fee had great chemistry and they made a great couple; I really enjoyed the dialogue between them. The dogs, lol! I think NR made many a reading a fan of dogs with this book. ;P I've really enjoyed the last two stand alone books (Black Hills and this one), and I'm really looking forward to the next one too. I really loved Simon and Fiona's relationship and their personalities :P I think they fit well together. Nath, we all agree! This was a great addition to NR's SR books. The characters & the relationship were definitely the key. 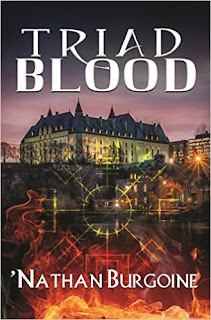 As usual an excellent thriller by this author that keeps the reader involved to the point of not wanting to put the book down. She provides just enough information about dog training that takes away the stigma of dog training, as well as the one of search & rescue.